When planning to grow cannabis, cultivators have a variety of options from which to choose and many decisions to make as far as methodology. In addition to deciding on the genetics, lighting, and nutrients to use, cultivators must choose the most appropriate grow medium—as well as whether the garden will be a hydroponic or soil grow. Both methods have their devotees, who will debate fervently about why their way of doing things is superior, but the fact of the matter is that both hydroponics and soil are widely used in the cannabis space, and both can produce outstanding cannabis. 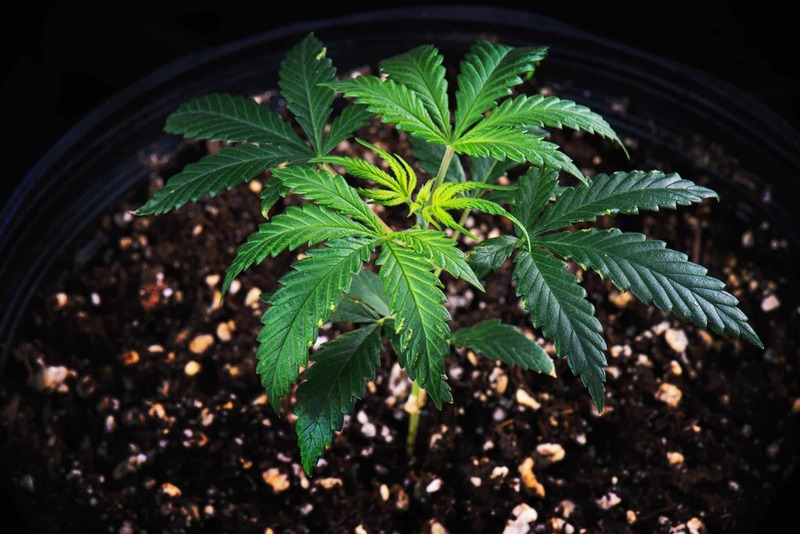 This article will address two of the lesser-used grow media: coco coir and perlite. Soil grows can utilize a wide variety of ingredients for various soil mixes, including basic potting soil, coarse sand, sphagnum moss, wood chips, coco coir, perlite, fine gravel, and compost. Combining perlite and coco coir as the only two ingredients in a potting mixture can yield great results, although its use together is somewhat unconventional compared to more mainstream practices that utilize soil in the mix. Perlite is a volcanic ash derived from obsidian. To create the form used in cultivation, it’s mined and then heated in a specific manner and treated so that it assumes the small granular form that has a Styrofoam appearance and consistency. Perlite is a popular grow medium for use in both hydroponic and soil grows. The absence of conventional potting soil makes the mix less dense, with lots of aeration, which promotes the development of cannabis root systems. Perlite is valuable for its ability to provide aeration to growing mixes. Many cultivation mixes utilize either perlite or vermiculite, and both work well. Both are a common ingredient in mixes, and each accomplishes the same purpose—aeration—so rarely will you see both used together. Perlite has some unique features that make it beneficial for both outdoor and indoor horticulture. It’s very lightweight—much like coco coir—so plant pots or bags will have much less weight when filled. Because of its lightweight, porous structure, perlite absorbs water like a sponge and retains it well, promoting water retention as well as aeration, which will prevent stagnation of dense soils. It also has a neutral pH level. Perlite pH typically falls in the 6.5 to 7.5 range—which is the perfect level for growing high-quality cannabis. When used with soil, perlite breaks up soil density and makes the mix less compact. It helps the soil retain water and provides vital aeration. Although a great way to grow cannabis, soil can become very compact, especially after repeated watering, which makes the soil settle. Perlite is valuable for breaking up the dense consistency of settled soils and allows cannabis to grow unrestricted beneath the soil surface. Also, because it promotes a less-dense consistency to cultivation media, it encourages faster water absorption and runoff. Perlite is inorganic and stable, so there is no risk of introducing harmful fungi or bacteria into a garden when using it. It will not decompose or break down to be a source of harmful pathogens. Coco coir is organic material that comes from the husk of coconuts. This coarse, fibrous material is an excellent medium for growing plants. Since they have a similar consistency, many soil mixes contain either peat moss or coco coir. Both can work well and have their own unique benefits and drawbacks. Most cannabis cultivators have a preference for one or the other, with more of them opting for coco rather than sphagnum and peat moss. Although similar to peat moss in its consistency, coco coir has its own unique set of benefits, which differentiates one from the other. One of the benefits of coco coir is that its pH typically runs 6.0 to 6.7, which is within the ideal range for cannabis—and very similar to the pH of perlite. Since coco coir is harvested from coconuts, it’s a renewable resource—unlike peat moss. It also absorbs water better and is easier to rehydrate if it becomes overly dry. It has excellent water-retention properties, retaining eight to 30 times its own weight. Like peat moss, coco coir is an outstanding habitat for microorganisms and is free of pests, pathogens, and weed seeds. Coco coir is also durable and due to its lignin content, it breaks down slower than peat moss. Finally, coco coir is typically less expensive than peat moss—and this lower cost is something that everyone can appreciate. Coco coir also has some drawbacks. It has a high salinity unless thoroughly washed, and its quality and consistency can vary more than peat moss, depending on the source. It also doesn’t contain many microorganisms and few trace elements. Also, because some coco coir is sprayed with pesticides in its country of origin, combined with its tendency to be high in sodium and magnesium, means that it must be thoroughly washed and treated (follow the same instructions for treating coco coir as the peat moss method detailed above). Because peat moss and coco coir have several similarities as well as differences, it’s easy to see why both are popular. There are really no right or wrong answers when it comes to using one or the other; it’s just a matter of personal preference. Some popular soil mixes on the market include both. Since it’s used less often than coco coir for cannabis cultivation and has many benefits, do not overlook peat moss the next time you plan a cannabis soil mixture. Most likely, you will be happy with the results and use it as a regular soil ingredient. Because both coco coir and perlite are low in density, the combination of both will promote rapid, unrestricted root growth as well as rapid runoff, while still retaining beneficial moisture. While they work in similar ways, the consistency and shape of each is quite different, which makes their use together fairly popular. Let’s discuss the creation of two basic cultivation media that are similar and extremely easy to create. Both contain coco coir and perlite, but one mix has just these two ingredients, and the other includes another valuable ingredient. The first is just a basic coco coir and perlite mixture. The mix should contain more coco than perlite, at a 60/40 or 70/30 ratio of coco/perlite. This combination will make a good medium for transplanting young cannabis plants started in soil into their permanent mix. Include the soil when transplanting the seedling into its new pot. The well-aerated coco/perlite will provide an excellent way for the root systems to grow in an unrestricted manner. The mix will likely settle. Simply adding more coco/perlite or some compost will help maintain sound, organic growing practices. The second mix has one more ingredient but is nearly as easy to make. The recipe is simple and includes equal parts of compost, coco coir, and perlite. You can either make your own compost or buy it bagged at a nursery. Thoroughly mix the three ingredients together, and plant or transplant directly into the mix. Either of these mixes results in thriving plants if they are maintained correctly. Both will require organic soil amendments. Good organic amendments include kelp meal, bat guano, blood meal, rock phosphorus, and earthworm castings. Both of these mixes will provide good results in pots that allow easy and rapid runoff. Air Pots® work very well for either of them. Because both coco coir and perlite, as well as Air Pots, promote rapid runoff and aeration, there will be a stronger need to water and feed the plants, especially during their most vigorous stages of growth. If you’ve mostly used more traditional grow media, coco coir and perlite are well worth trying. When used correctly, they provide an excellent way to grow outstanding organic cannabis.